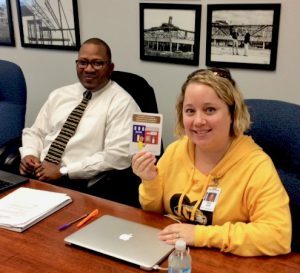 University to support the district as they tackle challenges in the aftermath of the tragic death ofMichael Brown that shook this community’s culture to its bones. This is a strong and geographically large district with 23 schools working for 11,000 children. Much is at stake, and multiple goals are at play. Action research teams, supported by coaches from the district’s new Transformation Project, are learning to use Systems Thinking and Design Thinking tools to examine ways of effecting positive change. 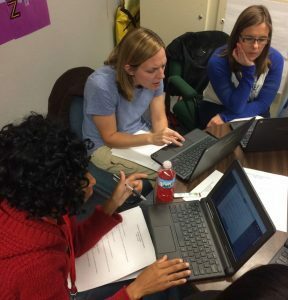 Not only do these educators hope to see school cultures shift, they are also embracing a new way of examining problems with an action researcher’s eye. Typically, a problem bubbles up, and we hustle to put a cap on the symptoms. Picture a bottle of Pepsi. If we drop the bottle, let roll across the garage floor, and immediately try to open it, we get a face full of carbonated spray. Even when we successfully recap or try bottle-tapping tricks, the soda goes flat, and it doesn’t really satisfy the thirsty drinker. So goes the problem that too quickly falls prey to the fast fix. With action research, we alter that pattern. Using a Plan/Act/Reflect cycle, educators can figure out ways to re-see and rethink trouble spots. With the shaken Pepsi, if you wait two minutes, the soda won’t be flat. The pressure difference between the headspace and soda will over time cause the CO2 to re-dissolve until the pressure is equalized. Warmer soda means less CO2 can be dissolved. Educators, too, may get more lasting, positive results when part of the solving process is stepping back a bit. With action research, dedicated administrators and teachers in the district are joining hands and minds to approach problems with a mindful researcher’s toolbox. Instead of attaching ourselves immediately to a possible outcome, we open ourselves to other solutions, ones we often cannot see when we work in isolation or in a state of impatience.  patterns and connections that are emerging. For example, if a student is acting up in one spot, why is it that the same student does not act up in another? What are the adults in the building doing that show connections to various behaviors? Are those things affecting students and how? The team begins to pose many questions related to the problem, recognizing that underlying issues almost always affect what is visible on the surface. to making a sustainable, positive change in the behaviors of students and adults alike. 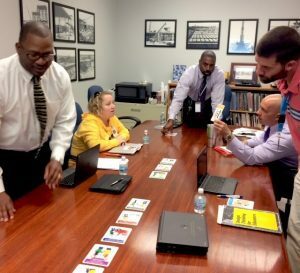 At McCluer North High School, an action research team comes together to examine the culture and the potential ways that the existing culture might become more resilient, compassionate, and empathetic. Through this year-long endeavor the team is using Systems Thinking and Design Thinking to enrich their own toolboxes for making a difference. Basically, Systems Thinking pushes the team to recognize the connections within the school. When any decision is made, it has an effect on not only the target issue, but also on issues around the corner that might otherwise be unrecognized. Designing ways to solve problems means the team is building skills in acknowledging the patterns and connections within multiple layers of the school culture. 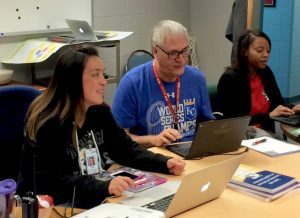 A grade level principal at McCluer North, David Arledge, for example, points out the need to continually examine data and make adjustments as more information is brought to the table. A student might have an attendance problem, and the more data that is examined, the closer he can get to building effective solutions with that student. “We examine the data, go back and make adjustments, and try to figure out what is working and what isn’t,” Arledge notes. Collecting data, whether it be interviews with students or photos taken in class or the halls, helps inform the plan. Acting before we have data information of various sorts, almost guarantees that our solutions will fall flat. At Commons Lane, the action researchers, with the guidance of their coach Lee Ann Lyons, take time to read and deconstruct professional readings on empathy, a powerful pathway to positive culturebuilding. 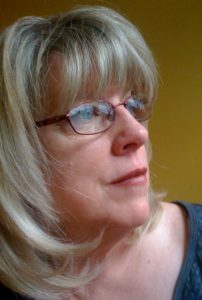 Third grade teacher, Tanya Parson notes, “’Two types of empathy, cognitive and affective, develop at different times for boys and girls, boys being a couple years behind girls.’ What is troubling is that we, as a society, have a tendency to tell boys to be tough and not show their emotions,” thus we shut down these boys’ need to practice and develop empathy in a world that needs just that. As action researchers expand their own learning and share that experience with their team, new understandings, possibilities, and varied solutions can emerge. The capacity to build a stronger school — a transformed school — becomes more than an aspiration; it can become a reality.